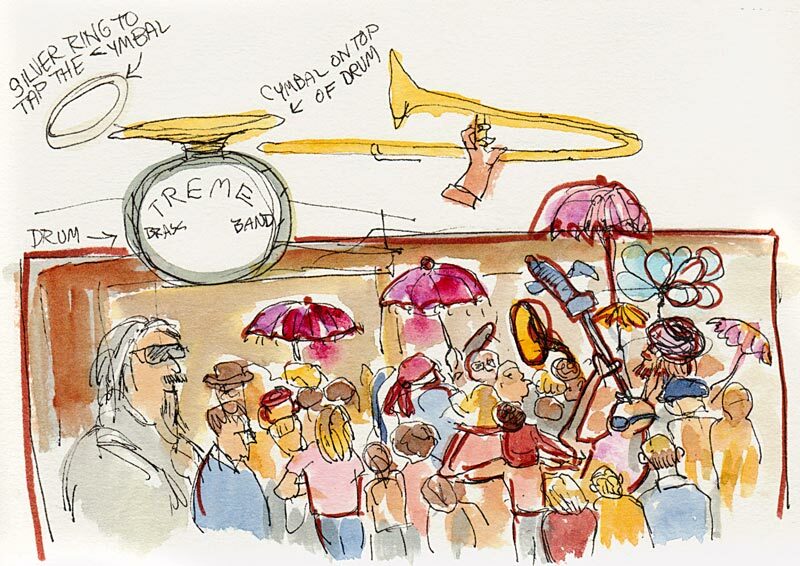 After they played 20 minutes or so, we danced (and sketched) along behind the band to the Berkeley BART station, with many people twirling handkerchiefs or parasols in the air as is the tradition in second line parades. They performed another brief concert, and then more people joined in the parade as we moved along Shattuck Avenue. 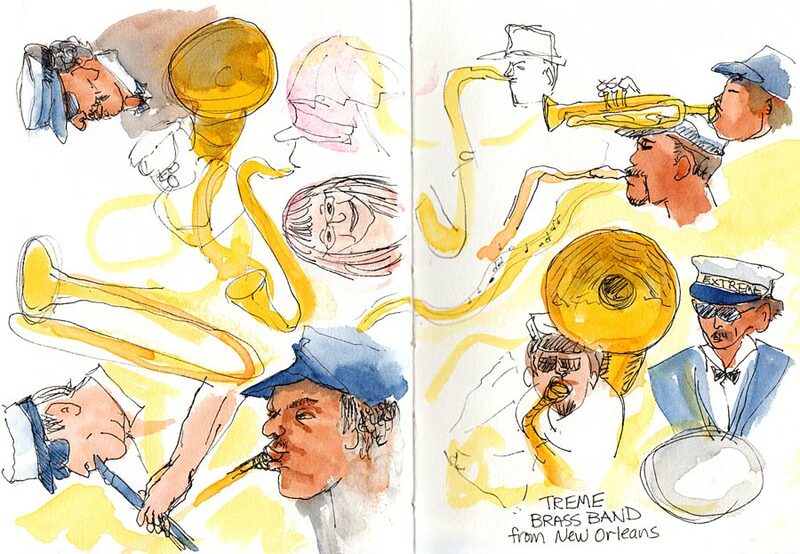 The parade ended at Freight & Salvage on Addison Street where we were again treated to more great Dixieland music. 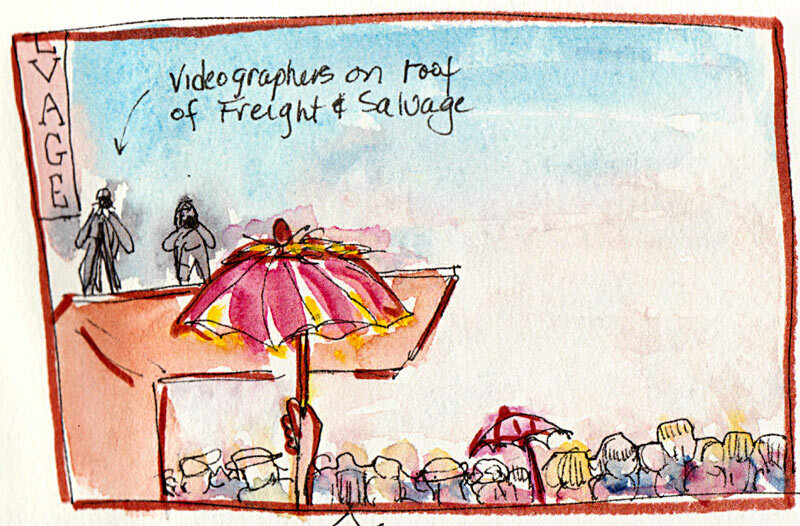 By then I was pretty far back in the crowd so gave up trying to draw the band but noticed these guys on the roof videotaping the event as we arrived. 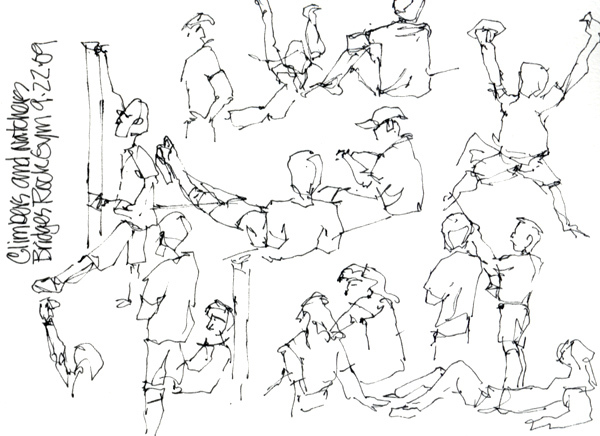 This was one of those “It doesn’t get any better than this” experiences: Fantastic live music, sunshine and sketching! 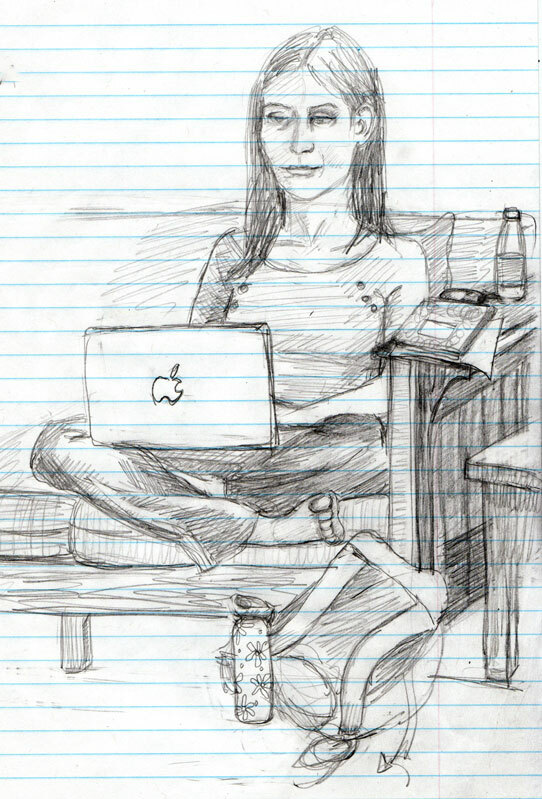 I knew the sketching would be challenging because of the constant movement, so only had as my goal to have fun and give it a try. I definitely had fun! 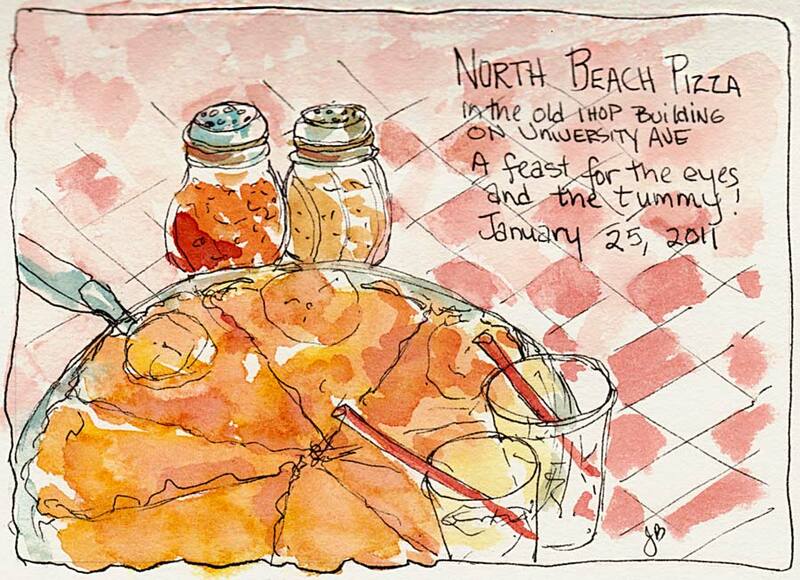 North Beach Pizza in Berkeley is housed in a former International House of Pancakes. Pizza is a sort of large pancake, I suppose, but I wouldn’t want it served with maple syrup. 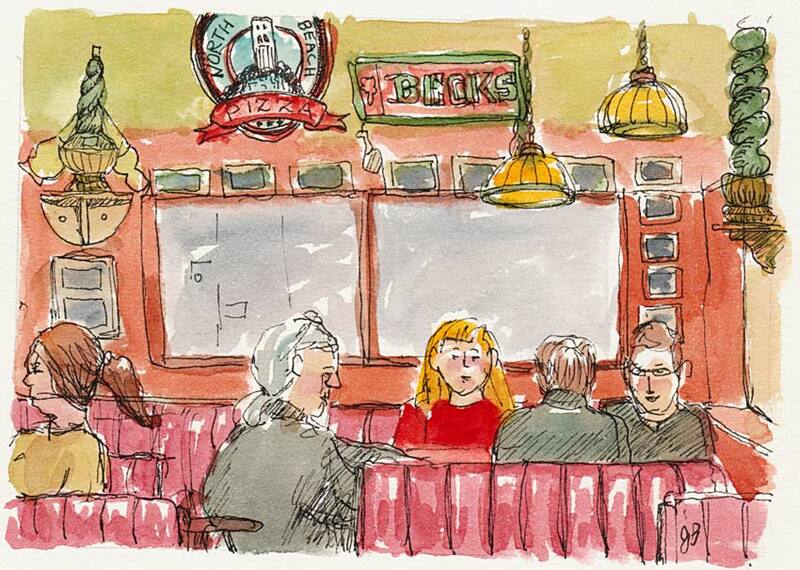 We had a good time eating, chatting and sketching the night away, six of us in one cozy booth. 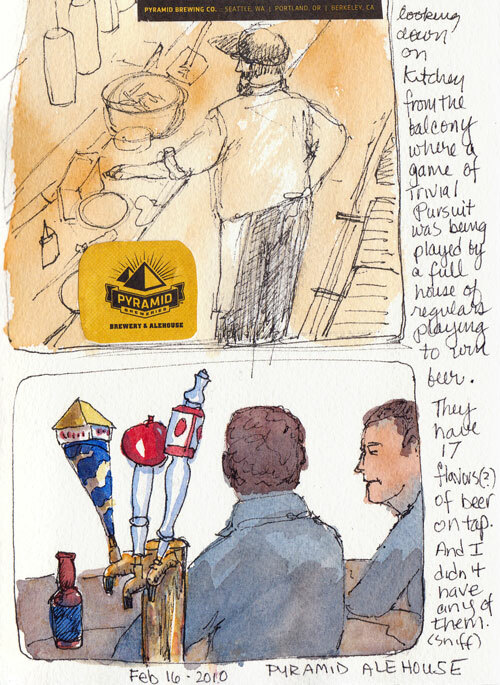 Pyramid Alehouse in Berkeley is a lively, fun place for good food, good beer and sketching too. 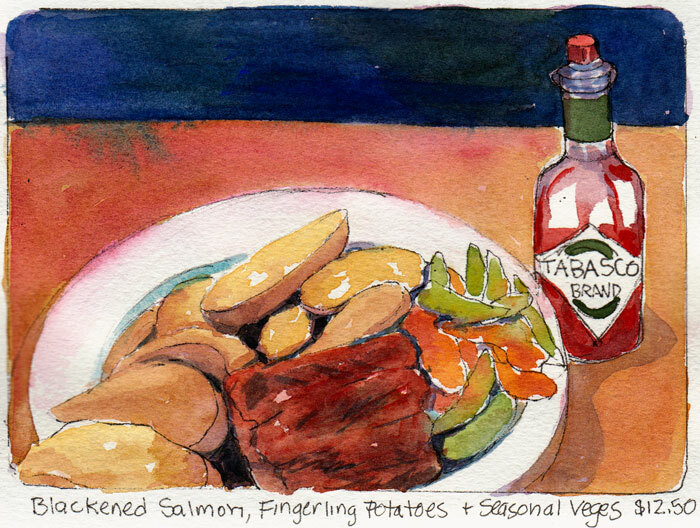 My blackened salmon was delicious and a real challenge to wait to draw and paint before eating. After dinner we planned to sketch the brewery area visible from our table. But mid-meal they turned the lights off in the brewery so we went upstairs to check out the view. 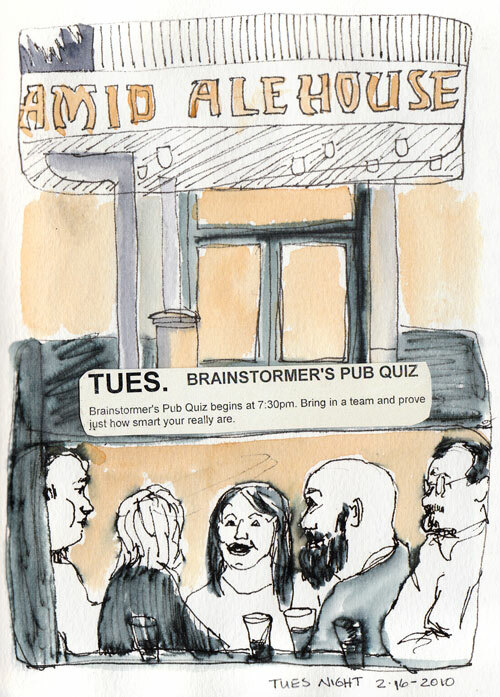 Upstairs there was a crowd of people playing Pyramid’s version of trivial pursuit “Brainstormers Pub Quiz,” with an announcer reading off the challenges that teams try to solve. The teams with the most points win more beer. I assume there is an honor system that prevents people from getting the answers on their smartphones. I couldn’t play trivial pursuit unless answers like, “You know, it was that guy who was in that movie with that blonde…” would win a prize. 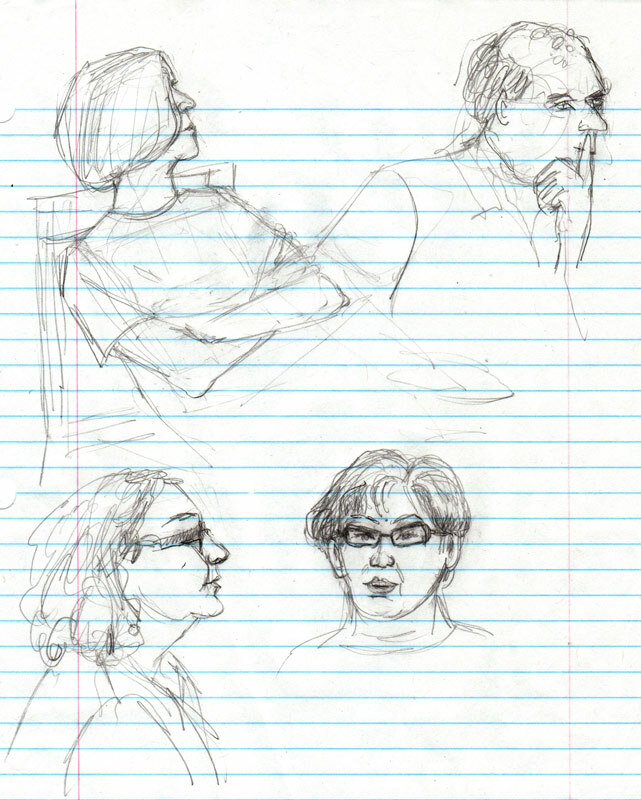 While we were upstairs I (tried to) sketch the chef in his galley kitchen. 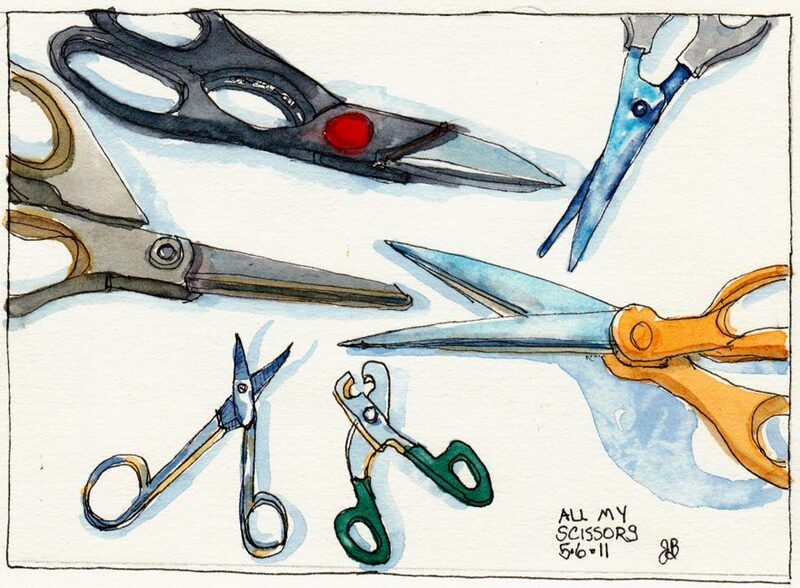 The perspective was challenging. Then we went downstairs to the bar area. I loved the whimsical handles on the taps, each reflecting some feature of the specific beer. They had 17 beers on tap that night. I just noticed my color-scheme on these pages: they’re all predominantly beer colored. 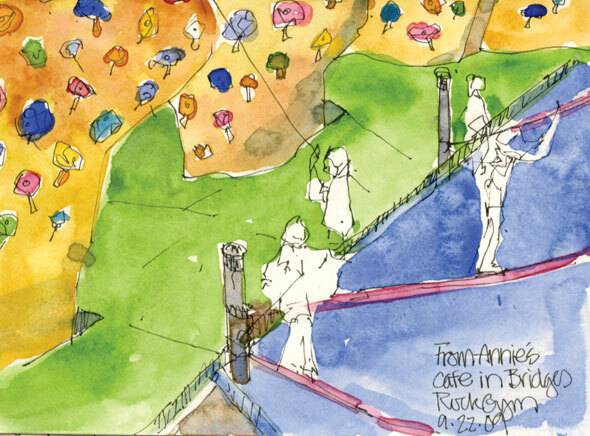 For last Tuesday night’s sketchcrawl, we went to Bridges Rock Gym to sketch people climbing on the rock structures and practicing “slack lining” (like tight-rope walking). 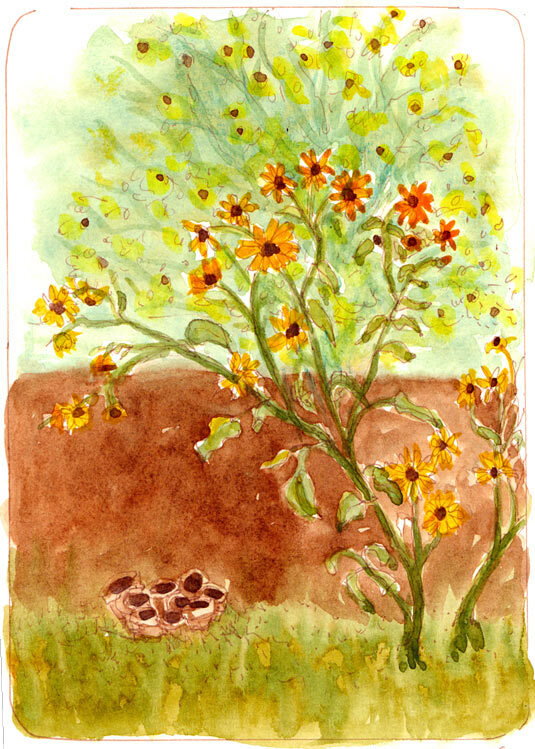 When I arrived I sketched these sunflowers growing on a little garden plot besides Tin Roof Yoga, attached to the gym. The Assistant Manager, Jeffie, told me that the sunflowers were “volunteers” that sprouted up in the dirt they obtained for the plot by Annie’s Annuals. 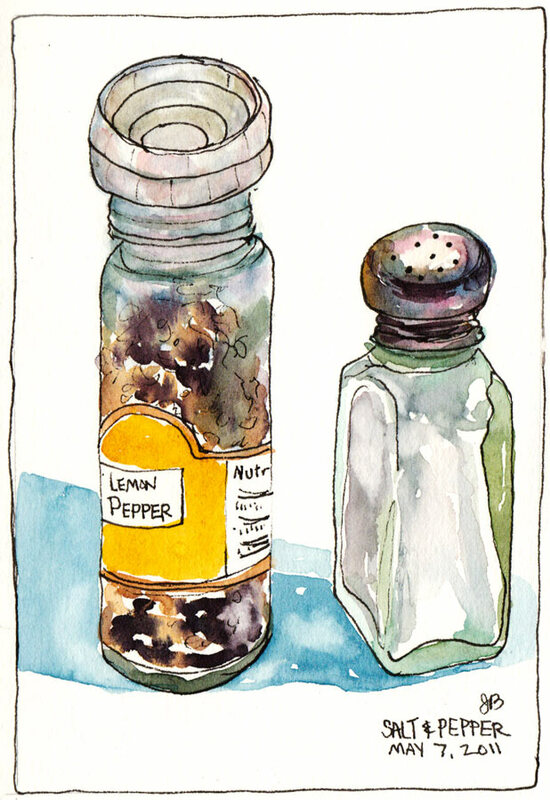 Since I was hungry and we were sketching from the cafe on the loft’s balcony I enjoyed a plate of homemade hummos, veges and pita bread, and sketched the salt shaker while I waited for my food. The cafe was offering free samples of their homemade ginger cookies — best I’ve had! 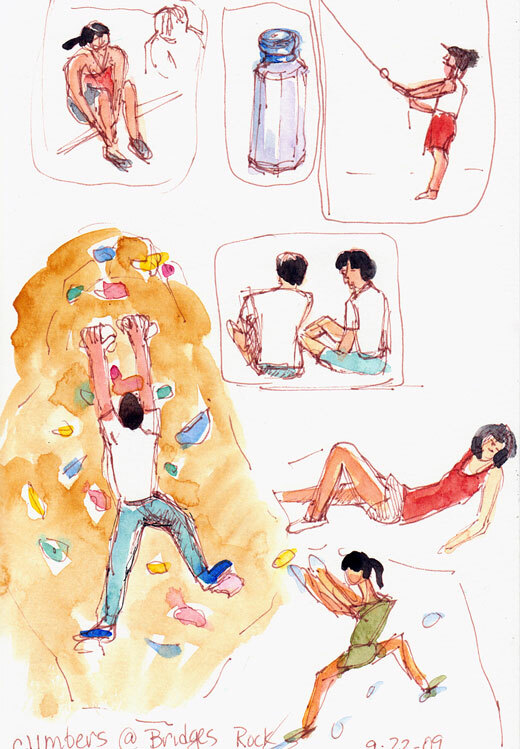 Then I tried to draw the moving targets of people climbing rocks (above). If you have a chance to visit the gym, be sure to look at their amazing photobook of the gym’s owner slacklining high atop peaks in Yosemite, from tree to tree in the Berkeley hills, and several floors above a Polish shopping mall. 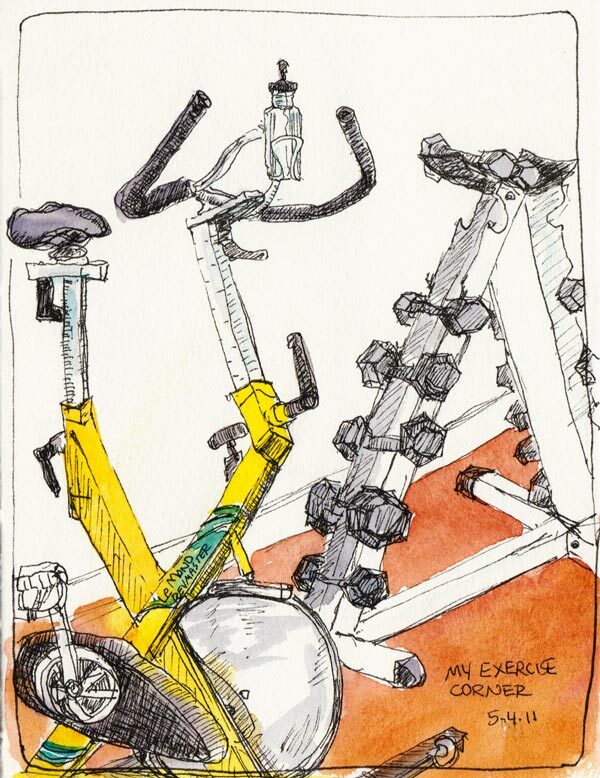 Visiting the gym made me wish I wasn’t scared of heights — it’s such a beautiful place, with great amenities and very friendly staff. Everyone is welcomed and the night we there we saw absolute beginners, a small group of children, and some very advanced climbers with amazing muscles. When it was time to go, I was just starting to get the hang (no pun intended) of how to approach sketching the climbers, noticing that as they climbed or balanced on the rope, the movements were in patterns that kept repeating so it was just a matter of waiting a couple seconds and they’d be back in that frog-like position, for example. I’ll come back to sketch again and to try out their yoga studio.